The Blackwell Family Secret: The Guardians of Sin is book 1 in Jonathan L. Ferrara’s YA urban fantasy series. I must say this was a thoroughly enjoyable read, and I can’t wait to read the sequel. After his parents are killed by a demon, sixteen-year-old Nicholas Blackwell is put under the protection of the Vatican and sent to a boarding school surrounded by a deep forest: St. Christopher’s Academy, complete with iron gates, gargoyle statues, and gateposts that leer at him. As his life is in danger, this is the only place where he can be kept safe. 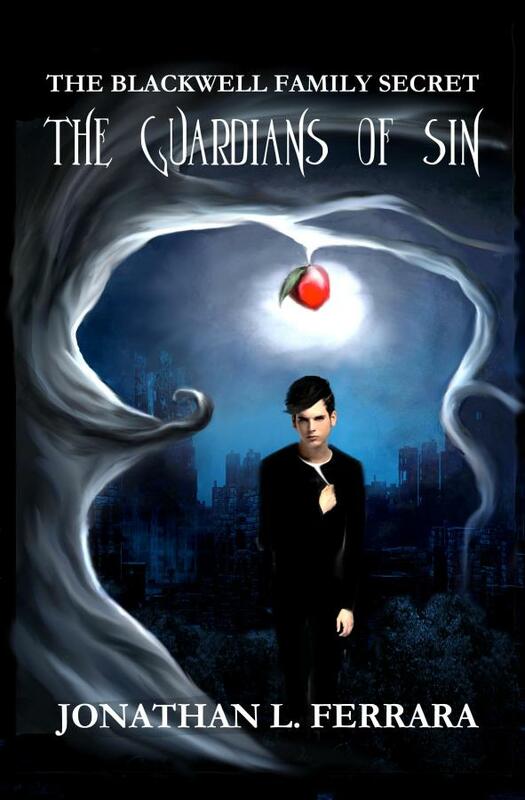 One night he ventures into the woods and a serpent tricks him into eating the forbidden fruit, with disastrous consequences–for the Guardians of the Seven Deadly Sins have been unleashed, and now Nicholas must go into the City of Demons and defeat the Princes of Hell, and in the process discover his family secret, one that could change the entire world…A daunting task for a teen, even if he happens to be the school’s cockiest leader of mischief. I loved the book. Nicholas is a charming protagonist, cleaver, arrogant, yet brave and selfless at times. Ferrara’s world, inspired by Biblical tales, of course, is elaborate and imaginative. I especially loved his focus on the Seven Deadly Sins–what they are, where they came from, etc. Angels and demons are intertwined with fantasy elements, and the whole concept of good and evil is explored. There’s romance, action, adventure, and mystery. It is also a bit dark at times, which I enjoyed. Ferrara is a talented writer, his prose smooth and his dialogue witty. The pace was excellent and the story kept moving forward with increasing tension until the very satisfying ending that left me hungry for book 2. Recommended! Healing With Words: A Writer’s Cancer Journey is a compassionate and wry self-help memoir written by an award-winning author, nurse and poet, who at the age of forty-seven found her life shattered first by a DCIS (early breast cancer) diagnosis and five years later by another, seemingly unrelated and incurable cancer—multiple myeloma. 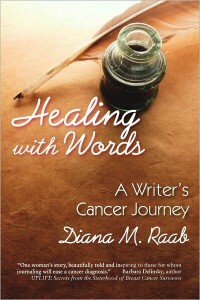 Healing With Words: A Writer’s Cancer Journey is Diana M. Raab’s second foray into the world of writing but her first journey into the world of healing. By combining the two, she has written a memoir that not only pulls on the heartstrings but helps to show us the power of the written word in our everyday lives and how we can utilize that to heal. Keeping that in mind, I began to read Diana’s story. At the age of forty-seven, Diana (who incidentally had no cancer in her family) was diagnosed with breast cancer. Enduring a mastectomy and the pain and embarrassment associated with it, Diana never really fully healed mentally. She found herself depressed (she had every reason to feel this way) after the operation which left her feeling less of a woman. Five years later, she was diagnosed again with an incurable cancer this time – multiple myeloma. This is Diana’s story. What is unique about her story is that over the course of her journey dealing with cancer, she decided to take up journaling to talk about her experiences and in so doing discovered something so powerful that pills couldn’t even touch – the power of healing through words – intimate words, gut-wrenching soul-searching words that enabled her to talk about her feelings and emotions that were always bottled up inside of her, thus inhibiting her ability to full heal until they all spilled out onto paper. Thus, Diana decided she not only was going to tell her story but by incorporating an interactive question and answer section to the back of every chapter, it would enable those who had cancer themselves to put their own words on paper and discover what a healing process it was. By doing this, they would find it would alleviate some of the stress which is so detrimental in the healing process. Healing With Words: A Writers Cancer Journey takes us down Diana’s path of fears and frustrations. You’ll definitely need something to wipe your eyes as this is a story that will touch you deeply, no matter if you have cancer or not. Diana’s words are powerful, yet sensitive to the plight of a woman’s journey who is given the diagnosis of cancer and should not only be read by victims of the disease, but loved ones as well. 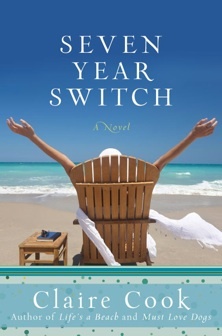 Claire Cook’s ‘Seven Year Switch’ book giveaway for reviewers! Because I know it’s the power of my incredible readers spreading the word to your friends and family that will make this book take off, we’re going to have another giveaway! You can post the same review on as many sites as you want – in fact I hope you will! – and each one counts as another entry! 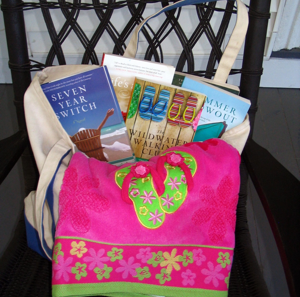 The prize is pictured above: a beach bag filled with a complete autographed set of all seven of my novels – and a beach towel, of course! If you already own signed copies of all my books, you can donate the whole thing to a fundraiser for your favorite charity or use them as birthday presents. Thank you — your support is what has made this midlife career of mine possible, and I appreciate it so very much. Visit Claire Cook’s website at www.clairecook.com. Dot Ryan, born and raised in Bee County in South Texas, makes her home in “the sparkling city by the sea,” Corpus Christi, Texas, with husband, Sam. Corrigans’ Pool is Dot’s first novel. She is busy writing her second and third works of fiction. 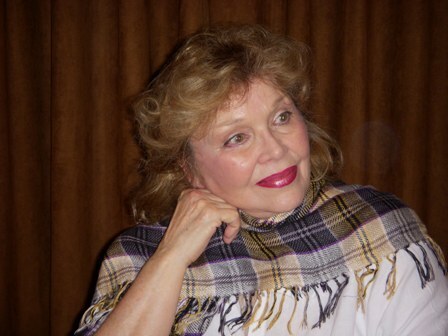 You can visit her website at www.dotryanbooks.com. Q: Thank you for this interview, Dot. Can you tell us what your latest book, Corrigans’ Pool, is all about? The eldest of two daughters, Ella Corrigan rises to the challenge when a family tragedy results in an incapacitated mother and a father consumed by guilt. Despite the pressures of essentially running the family plantation on her own, she bears the burden of responsibility stoically, with kindness, efficiency, and little resentment for her lot in life. Somewhat resigned to the possibility of never marrying, Ella is stunned by her reaction when she meets the dashing, if seemingly ill-suited, Gentry Garland. She repeatedly resists the attraction at first, resulting in moments both touching and amusing, until she finally accepts the love between them. From there, it doesn’t take long for Ella to begin envisioning a different, more enriching future—at least until the Civil War lands on their doorstep and Gentry strangely disappears without a word. Devastated, Ella makes the fateful decision to marry neighboring plantation owner Victor Faircloth. Victor’s increasingly contemptuous violence toward those who serve his household sickens Ella, and a gripping mystery begins to unfold involving his rapidly disappearing slaves and the beautiful pool, called Corrigans’ Pool, on Ella’s family property. As the Civil War rages on, Ella finds herself fighting a war of her own to save her home, her loved ones, and the innocent victims of her husband’s brutality. Villains and heroes are exposed in their true light, loves are lost and found, and the strength of human spirit ultimately prevails. Yes, Corrigans’ Pool is my first. I am presently working on the sequel to Corrigans’ Pool and two additional historical novels. Writing Corrigans’ Pool was easy, it was learning to write right that was hard! As I said in one of my blogs: The desire to write is all well and good but first one must learn to write! I married right out of high school and continued my studies “catch as catch can,” afterward. Driven by my insatiable desire to write, I began a campaign of self-study, hours in libraries doing research, reading and re-reading dozens of books on writing, subscribing to every writer’s magazine I came across in, enrolling in every writer’s course available within reasonable driving distance from my rural home and, of course, reading as many novels as I could. I finished Corrigans’ Pool in 1982 … and lost every page of it in a fire a few months later, along with most of my research notes. To make a long story short, I overcame my devastation and anger a few years later and began Corrigans’ Pool all over again. Yes, I experienced writer’s block from time to time. To get past it, I leaned back in my comfortable writing chair and read a few pervious chapters. If that didn’t work, I went through dozens of scrap-paper notes containing dialogue and proposed scenes, all of which I had jotted down over a long period of time and stuffed into a large manila envelope. Usually, one method or the other worked. Also, I have been told that books I donated to an area library are constantly checked out; that is a very good sign. There are also great reviews by buyers of the book on the Barnes & Noble site. In addition, a book club in Moon Township, Pa read and discussed Corrigans’ Pool and gave it five stars. They are mailing their books to me so that I can autograph them. I am flattered and grateful. All reviews, so far, have been good. I believe when other potential readers learn that Corrigans’ Pool is out there and being enjoyed, they will not regret buying it. I write at least five days a week, sometimes into the weekend. There are days when I write from sunup to sundown or longer if the words are flowing. I get teased by my grown children when they drop by and find me in my pajamas in the middle of the afternoon. I tell them that my pj’s are my writing costume of choice and they might as well accept it. Besides, I’m all for comfort when exercising the brain. I read or strum my old guitar. At one time early in my life, my hobby was writing songs. I have a box of my musical creations in the attic. A fantastic Texas singer, Joel Nava, was kind enough to put a few of them on CD’s for me. Just for fun, I will soon put these songs on my website under my blog, Memoirs of a Texas Dance Hall Queen: If you want a few laughs, go to dotryanbooks.com and read the Texas Dance Hall Queen blog. I’ve read books that affected nearly all of my senses, thereby giving me great pleasure as I read them, followed by enjoyable contemplation afterward. Other books have shown me darker images of life and human nature that perhaps I felt uncomfortable reading about but satisfied a need to be informed. For certain, these books changed my life in ways that improved me as a writer, but it is difficult to spotlight any one of them as the life changing book. …that next to my husband and children, writing is my life … so be assured that other novels are on the way! Thank you for this interview Dot. I wish you much success on your latest release, Corrigans’ Pool! Thank you! I enjoyed answering your questions. Homer’s Odyssey is the beautiful account of one blind cat and a woman who learned about life through the sightless eyes of a cat that was doomed (or so it seemed) from the beginning. In this first person narrative written by Gwen Cooper, the reader is taken on a journey into Gwen’s life as a single woman dealing with an underpaying job and a recently broken heart. Adopting another cat when she already had two was the last thing on her mind, especially a “special needs” cat. Keep in mind this is a blind cat and this is only a very small part of his amazing abilities. One part that was rather miraculous was not only could he scale seven-foot bookcases and leap five feet into the air to catch flies, but he was incredibly adept at chasing burglers out of Gwen’s bedroom and saving Gwen’s life. A truly remarkable book and one in which I enjoyed tremendously. This book will not only bring a smile to your face, but a smile to your heart. Excellent book and highly recommended! For more information, visit the author’s website at www.gwencooper.com. To purchase your copy of Homer’s Odyssey, click here to take you to Amazon. Interview with Christian Fiction Author Jimmy Root, Jr.
Jimmy Root Jr., author of Distant Thunder: Book One of the Lightning Chronicles is a life-long student of Bible prophecy and has connected ancient prophecies with world events in a fast-paced fiction thriller. Jimmy has been an ordained Pastor since 1982 and has served churches in Nebraska and Missouri. He and his family also served for five years in Colombia, South America as a church planter and educator. He is an alumnus of Central Bible College of Springfield, Missouri, and Southeastern University of Lakeland, Florida majoring in Theology and Cultural Studies. Raised in the Mid-West, Jimmy is an outdoorsman and sports enthusiast. He is an aficionado of the military thriller genre and is an avid blogger as well as an author. More can be discovered about Distant Thunder and the Lightning Chronicles series by visiting his website at: http://www.lightningchronicles.com. He also hosts a blog dealing with current world events and their relationship to Bible prophecy at: www.prophecyaler.blogspot.com, as well as a writer’s blog at: www.lightningchronicles.blogspot.com. Q: Thank you for this interview, Jimmy. Can you tell us what your latest book, Distant Thunder, is all about? A: You are Welcome. Distant Thunder is the first book of a Prophetic Fiction trilogy called The Lightning Chronicles. The story poses a question that I believe needs to be asked: What would happen if radical terrorists somehow got their hands on tactical nuclear weapons, and then used them against both America and Israel? It is a frightening scenario that is becoming more and more plausible in light of current world events. But in the midst of unimaginable terror and tragedy, two unsung heroes rise to extraordinary heights as they begin to understand that everything has been prophesied. A: Yes, Distant Thunder is my first novel, and what a blast it was to write it and see it published. A: It was not difficult at all, at least not until the editor got hold of it. Then the writing got serious. It was truly an exhilarating experience. I never experienced writer’s block during the process. I think that is because a large part of writing involves research. I might get hung up in the story simply because I need to delve a little deeper into what is between the lines of the story, but it all flows as the details fall into place. A: Very much so. With a first novel, one never knows how it is going to be received. But so far, I have had nothing but positive and exciting feedback. The funniest came from a US Air Force fighter pilot who also served as a combat instructor. Much of Distant Thunder revolves around an Israeli F-16 fighter pilot complete with several segments of air-to-air combat. This particular pilot picked up the book with skepticism written all over his face. You see, I have never even touched a fighter plane, let along fly one. I’m not a pilot. All I have is a computer flight simulator. But not three weeks went by before this guy emailed me with a one liner. “I can’t believe you nailed it.” The next time I saw him he just shook his head. Since then, other pilots have commented that the aerial sequences are accurate and thrilling. A: There’s no doubt that writing takes discipline. However, I am also a full-time Pastor of a vibrant congregation. That takes up the bulk of my days and weeks. Therefore, I have been forced to carve out my noon hour specifically for writing on my novels, and my evening or early morning times for working on my blogs. A: Oddly, writing for me is relaxing. But I also have a few hobbies. I love to fish and hunt. Gardening is a great source of peace and quiet, and I am a passionate football fan. A: As with most students I had to read many of the classics during my high school years. But when I was 17 years old, my dad gave me a set of books called The Hobbit, and The Lord of the Rings. I was hooked. That was thirty-three years ago, and since then, I have read Tolkien’s masterpiece nineteen or twenty times. What a work of art! A: That’s a great question, and difficult to answer, mainly because I’m not that introspective. So, as with any wise man, I consulted my wife. Here is her response concerning the title of my life. “Saddle-up Your Horse: We’ve Got a Trail to Blaze.” I suppose that fits. I am a self-starter, am self-motivated, and love to create. A: “…I can do all things through Christ who strengthens me.” I believe and live that verse. It is my driving force. Thank you for this interview Jimmy. I wish you much success on your latest release, Distant Thunder! The crabby neighbors of El Camino can’t bear all the music, fun and laughter at the house of the new family on the block as aunts, uncles, cousins and grannies arrive for a big noisy reunion. Too Many Visitors for One Little House is a joyful story about the importance of being included. This book took me back to my old children’s picture book days and how I miss writing them! As a children’s book author (many moons ago), I can relate to Susan in many ways. She has a message and uses the whimsicalness of a children’s book to do it. So enjoyable! Ever had snotty neighbors? Or better yet, have you been that snotty neighbor where everything the other neighbors are doing that changes the way you have been living up to that point is driving you up the wall? Susan Chodakiewitz’s Too Many Visitors for One Little House could have been written about me! Susan’s message rings loud and clear: if you can’t beat’em, join’em! The illustrations by Veronica Walsh were beautifully displayed with whimsey and charm which makes reading to your toddler even more enjoyable. You’ll fully enjoy this cute little picture book. Highly recommended!